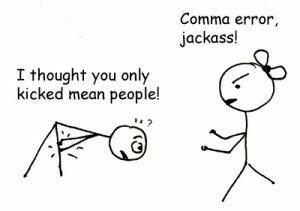 In a previous post I wrote about some of the most common comma errors: between clauses, with conjunctive adverbs (e.g., “however”), in a series or list, and with the words “which” and “that.” In today’s post I will address a few more common comma errors. In writing, we often need both to name something and provide some related descriptive information. An example: “The blog you are reading [descriptive information], The Proofreading Pulse [name], is filled with lots of useful information.” Sometimes a comma separates the name and the descriptive information and sometimes it does not; whether to use commas in these cases is determined by the order of the parts of the sentence, as well as by the essentially of them for the overall meaning of the sentence. The book Where the Sidewalk Ends has been a favorite with children for many years. My favorite book, Where the Sidewalk Ends, is sitting on the coffee table. Here, the title could be omitted and the sentence would still make sense (although listeners might still want to know what your favorite book is). When you describe something in writing, one adjective is often not enough, but adding adjectives can lead to comma errors. In some cases where two adjectives are put together a comma separates them, and in other cases there is no comma. The difference lies in whether the adjectives are coordinate or cumulative. Coordinate adjectives are two separate adjectives that both apply to a noun, and they are separated by a comma: “a green, leafy salad.” Note that both adjectives modify the noun. They can be switched (“a leafy, green salad”), and the word “and” can be inserted between them in place of the comma (a green and leafy salad), both without changing the meaning. Cumulative adjectives build upon each other, and they are not separated by a comma: “a light green leaf.” Here, the first adjective (“light”) modifies the second (“green”), which in turn modifies the noun. They cannot be switched, and the word “and” cannot be substituted for the comma.